Head over to Amazon where you can score this highly rated Lodge Cast Iron 10.5″ Square Grill Pan for just $11.05 (regularly $32.99) ! Perfect to sear, bake, broil, braise, fry or grill, this pan can be used at home in the oven, on the stove, on the grill or over the campfire! 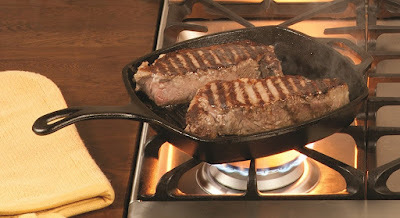 We have a couple of Lodge Cast Iron Pans and we LOVE them! Everything cooks evenly and the flavor is excellent!